Warrant Officer Sean W. Mullen, 39, of Rehobeth Beach, Del., died June 2, 2013, in Ghur Ghuri, Afghanistan, of injuries sustained from an improvised explosive device. Mullen was assigned to Company B, 2nd Battalion, 5th Special Forces Group (Airborne), Fort Campbell, Ky., as an assistant detachment commander for a Special Forces Operational Detachment-Alpha (ODA), or A-team. He was deployed in support of Operation Enduring Freedom-Afghanistan. This was Mullen’s sixth deployment in support of an overseas contingency operation. 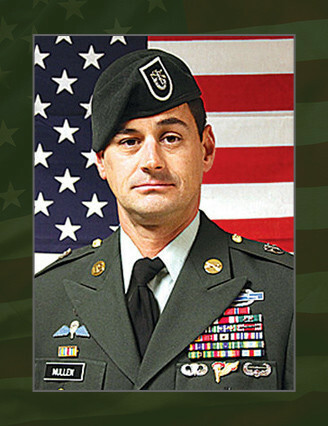 Mullen enlisted in the U.S. Army in November, 1995, as an infantryman. Upon completion of basic training and advanced individual training, Mullen was assigned to 3rd Bn., 327th Infantry Regiment, 101st Airborne Division (Air Assault). After successful completion of the Basic Airborne Course at Fort Benning, Ga., he was assigned to 1st Bn., 325th Airborne Infantry Regiment, 82nd Airborne Division, Fort Bragg, N.C. In March 2001, Mullen was assigned to 1st Bn., 503rd Infantry Regiment, 2nd Infantry Division, Camp Casey, Republic of Korea. In April 2002, Mullen was assigned to instruct at the Basic Airborne and Pathfinder courses at Fort Benning, Ga.
Mullen volunteered for the Special Forces Assessment and Selection Course and completed the Special Forces Qualification Course in April 2007. He was assigned to Co. A, 2nd Bn., 5th SFG (A) as a medical sergeant and later became the senior medical sergeant for the company. Mullen spent two years on a Special Forces team until his selection as the company operations sergeant. After a successful deployment as the company operations sergeant in support of Operation Iraqi Freedom, Mullen was assigned as the senior medic for a Special Forces team in Company A. Mullen deployed again in support of OIF. Mullen was a member of the first battalion within the U.S. Army Special Forces Command (A) qualified to conduct Unconventional Warfare. Mullen additionally deployed to the Kingdom of Saudi Arabia in support of Special Operations Command – Central requirements. Mullen was selected to attend the Warrant Officer Technical and Tactical Certification Course; graduating as a Warrant Officer in November 2012. Mullen’s military education includes the Special Forces Qualification Course, Warrant Officer Technical and Tactical Certification Course, Advanced Special Operations Technical Course, Special Forces Medical Course, Special Operations Combat Medical Skills Sustainment Course, Total Army Instructor Training Course, Warrior Leaders Course, Advanced Leaders Course, Senior Leaders Course, Combat Life Savers Course, Survival, Evasion, Resistance, and Escape Course, Combatives Level 1, Pathfinder Course, Static-line Jumpmaster Course, Infantry Mortar Leaders Course, and the Airborne Course. His awards and decorations include two Bronze Star Medal, three Meritorious Service Medals, three Army Commendation Medals, Joint Service Achievement Medal, eight Army Achievement Medals, five Good Conduct Medals, National Defense Service Medal, Afghanistan Campaign Medal with two campaign stars, Iraq Campaign Medal with three campaign stars, Global War on Terrorism Expeditionary Medal, Global War on Terrorism Service Medal, Korea Defense Service Medal, Armed Forces Service Medal, two Non-commissioned Officer Professional Development Ribbons, Army Service Ribbon, two Overseas Service Ribbons, Army Reserve Component Overseas Training Ribbon, Joint Unit Meritorious Award, two Army Meritorious Unit Commendation Award s,Combat Infantryman Badge, Expert Infantryman Badge, Pathfinder Badge, Air Assault Badge, Senior Parachutist Badge, Parachutist Badge, and the Special Forces Tab. He was posthumously awarded the Purple Heart. He is survived by his wife and parents.